In Santiago, we spent a half-day with a guide — seeing some of the more famous sights and getting taste of this complex, vibrant city. We saw the changing of guard at La Moneda (actually, we saw the horses’ hind ends as they walked away) and other significant government buildings, as well as a number of armored vehicles belonging to the Carabinero poised around the city. I am at a loss to explain why so many armed guards and armored vehicles are necessary and visible,* but I was amused at the nickname for a small vehicle that sprays tear gas: The Skunk! ** There is a notable tension between obedience to authority (apparent in the presence of armed soldiers and guards everywhere) and disrespect for authority (graffiti everywhere despite presence of soldiers and guards). We visited the city’s oldest surviving structure — the Church of San Francisco, built in 1575-1613 – and the Metropolitan Park — a 1,780 acre wilderness that rises up high in the middle of an otherwise flat city and provides beautiful views on all sides. I am turning the microphone over now to The Photographer, who has a few things to say. Why is a church built c. 1600 the oldest structure in a very old city? Earthquakes. 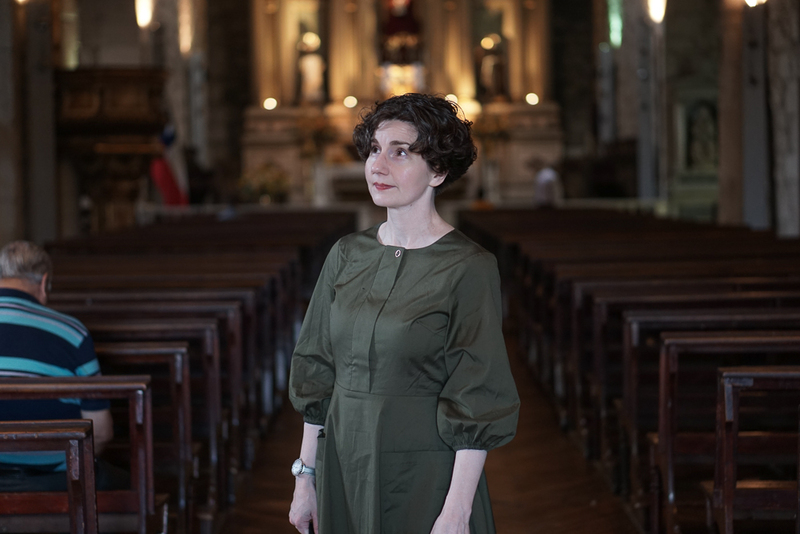 Santiago has experienced some of the largest earthquakes recorded by man — approximately one major quake every century — and these events destroyed much of what stood there. As a result, Santiago today has some old buildings, a large number of concrete, brutalist and mid-century modern structures, and some very modern gleaming glass buildings. On a side note, Chilean contemporary design — as seen inside museums and smaller structures — is elegant, with clean lines, and beautiful details. Inside Metropolitan Park is a beautiful botanical garden. Note: You will see more of this dress next week, but I encourage you to buy it for yourself now. It’s from Cuyana — here is a link. 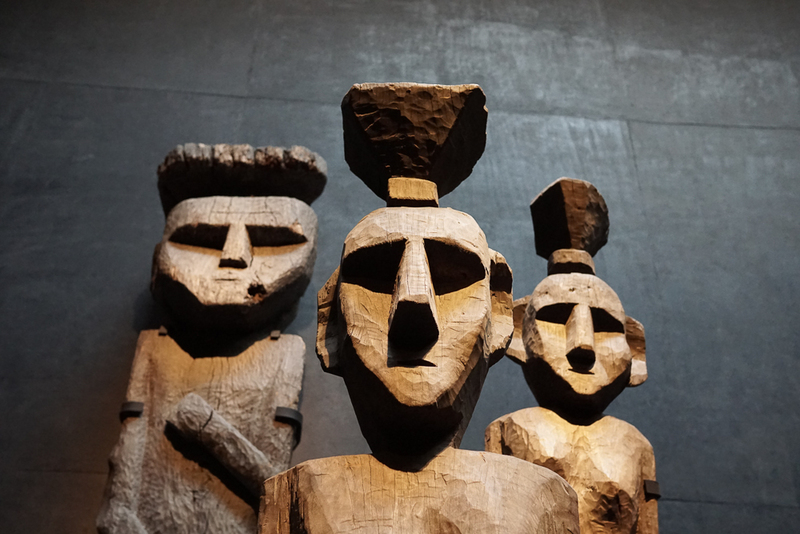 The Photographer agreed to accompany me to the Museum of Pre-Colombian Art, which, to his surprise, he enjoyed. I asked him why he had thought he wouldn’t enjoy it. I thought it might be nothing but old pots. My response? I could look at old pots all day. The Photographer will now tell you what he thought of the things-other-than-old-pots that he saw. 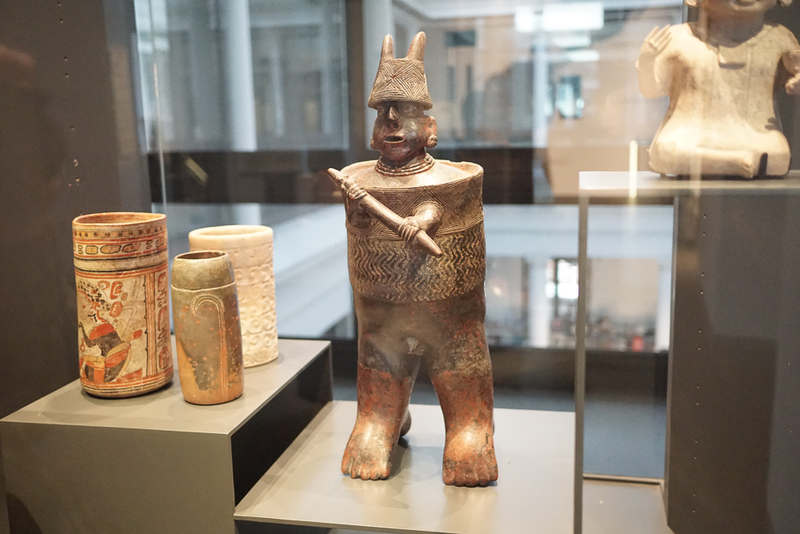 In the museum of pre-Columbian art, this remarkable fellow who looks like a cross between John Goodman and a garbage can. The feet. Why the feet? At any rate he is very stable. 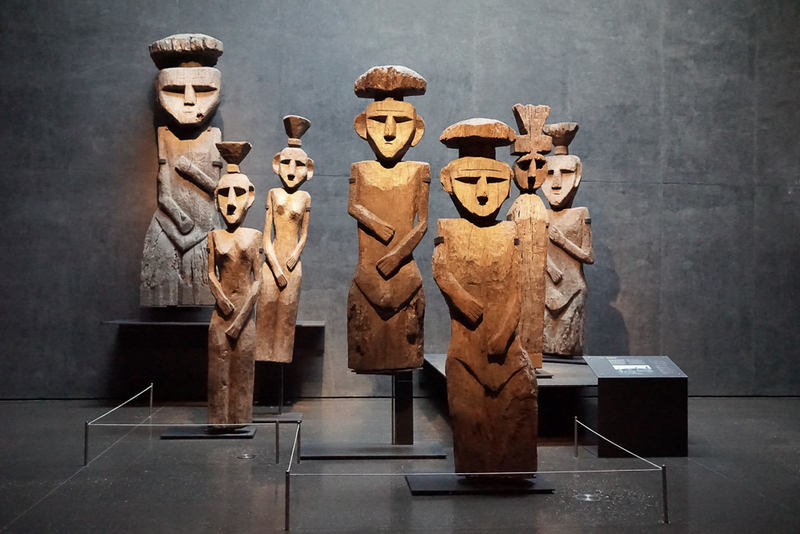 Coming upon these astonishing figures, deep in the lowest story of the museum, was like encountering a delegation of aliens that had been waiting, very patiently, to talk to me. They’re from Easter Island. “Tell us the word,” they said. “But I don’t know the word,” I said. “We will wait,” they said. 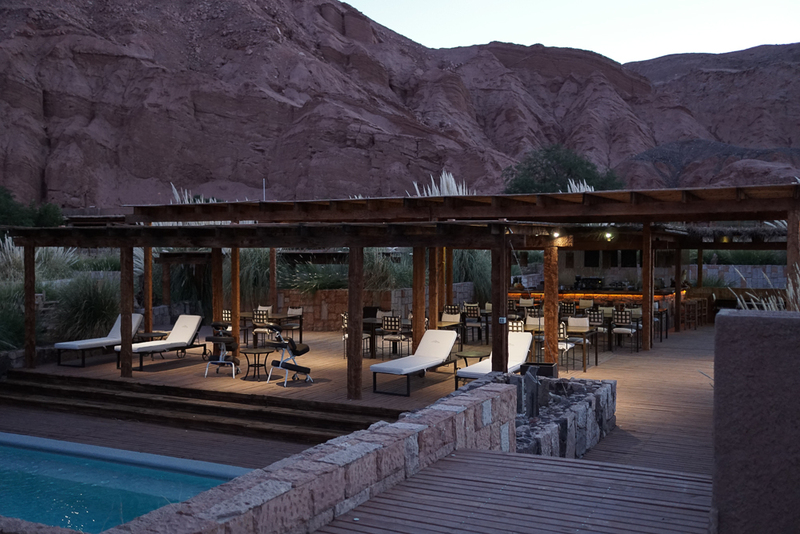 This is our hotel: the Alto Atacama. 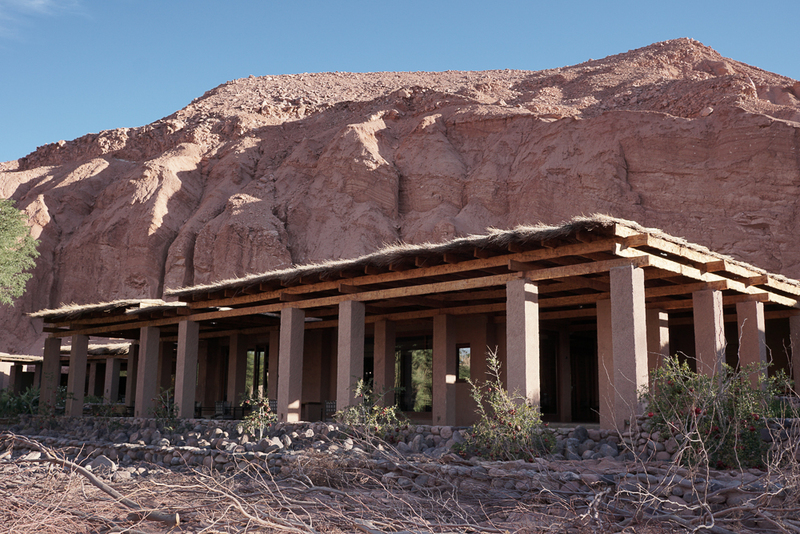 There are many varied sights to see within the Atacama Desert. Yesterday we visited the Salt Flats. Perhaps you can make out the white on the ground? That’s not snow. It’s salt. 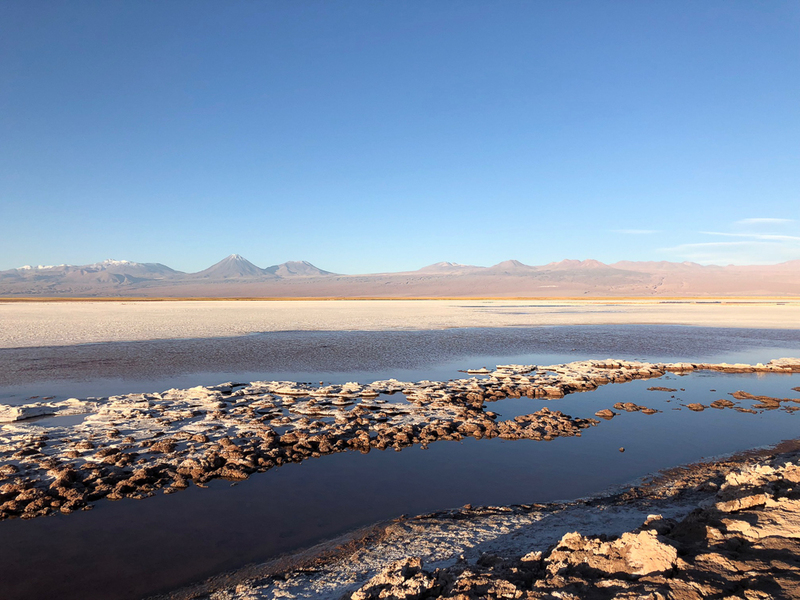 It looks incredibly desolate, though there are interesting varieties of extremophiles here — bacteria that can live in impossibly harsh environents. This is the place on Earth that’s most like Mars. Astrobiologists study this area for clues to how life could originate and survive on Mars, Europa, Enceladus, and other places. 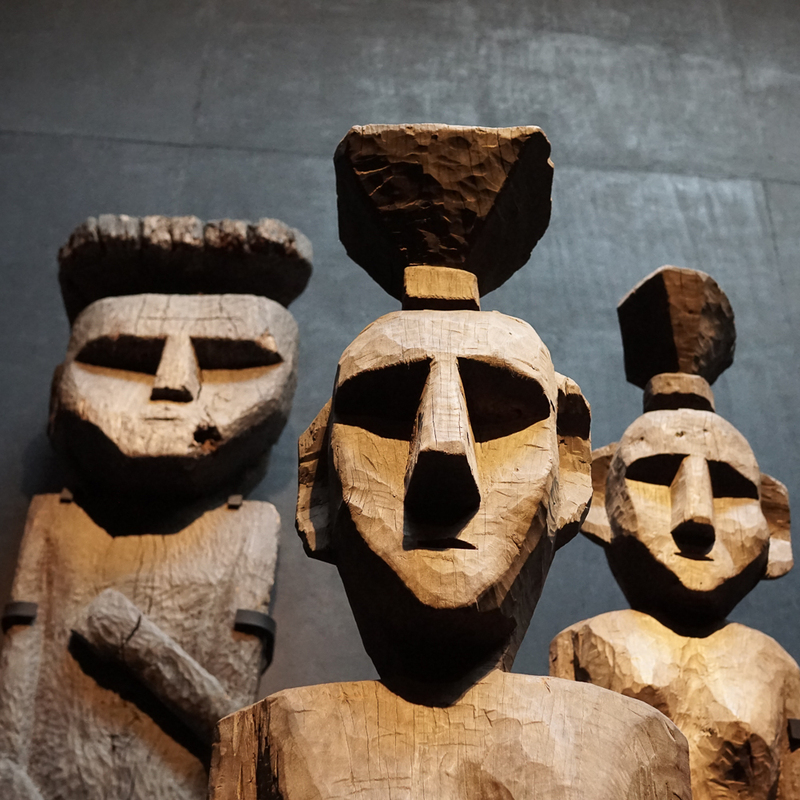 Maybe the alien delegation from Easter Island is waiting to tell us the secret. We asked a nice man to take our picture with Michael’s iPhone. He was a photographer just like me (The Directrice); you can see his finger across the bottom right corner of the photo. It’s called a signature. 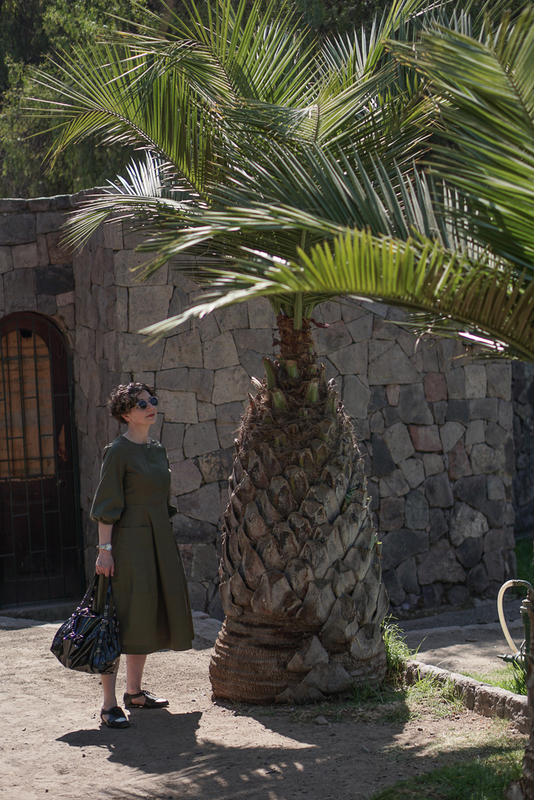 This scene makes our hotel all the more impressive, a small oasis in a harsh landscape. Temporary headquarters of Directrice Global Industries Ltd.
* Though we did receive this warning, the week before we left: The U.S. Embassy advises U.S. citizens traveling and residing in Chile that potentially violent disturbances are probable in Santiago and possibly Valparaiso in connection with the anniversary of the Day of the Young Combatant (Día del Joven Combatiente) on Tuesday, March 29. This day commemorates the deaths of the brothers Rafael and Eduardo Vergara Toledo on March 29, 1985. Disturbances could begin in the days leading up to March 29. Historically this day has been marked by incidents of violence, including the burning of buses and throwing of rocks and bricks at bystanders and vehicles. In 2015, a Carabinero was killed. Incidents have occurred in downtown Santiago, specifically on Avenida Libertador Bernardo O’Higgins and Avenida Americo Vespucio as well as in the vicinities of Universidad Pedagogico de Macul, Villa Francia, Estacion Central, Cerro Navia, Puente Alto, and La Legua. We recommend avoiding these areas on March 29, as well as outlying parts of Santiago and Valparaiso, particularly at night when incidents of violence will likely escalate. There will be a large increase in Carabineros posted throughout Santiago. In previous years, Santiago residents have been advised to keep flashlights and candles nearby in case electrical transformers are damaged by vandalism. Hmmmm. ** But I am troubled by the thought that this vehicle disperses tear gas often enough to have a nickname. 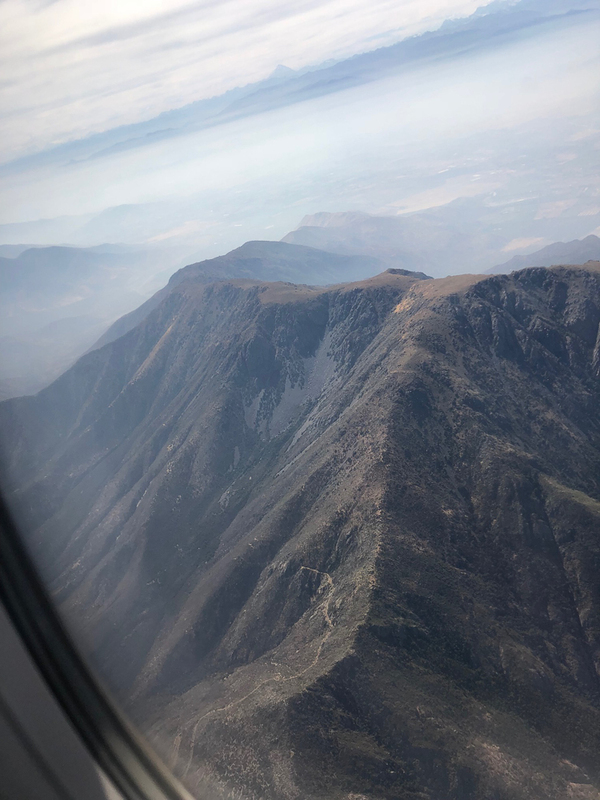 I studied abroad in Santiago – loving this glimpse into your trip. You’re right about the beauty of contemporary Chilean design. 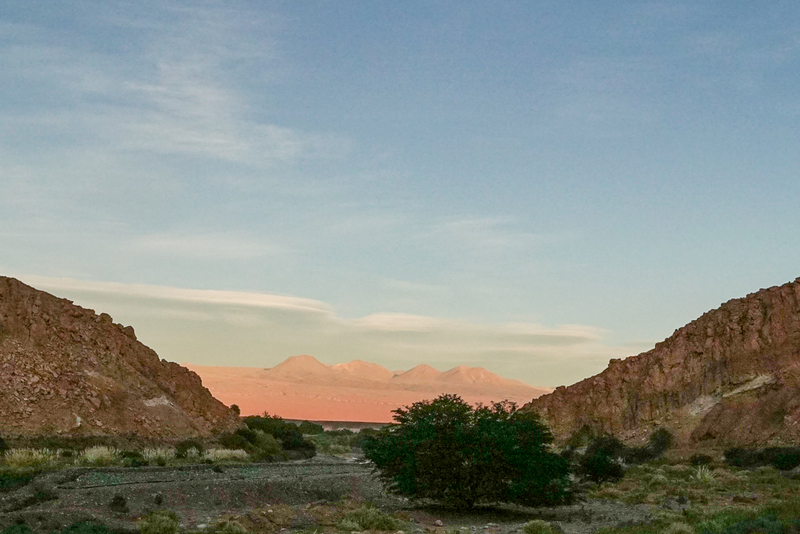 And the Atacama desert is spectacular – see if you can go sandboarding! Thanks for the travelogue! I love the Easter Island statues. 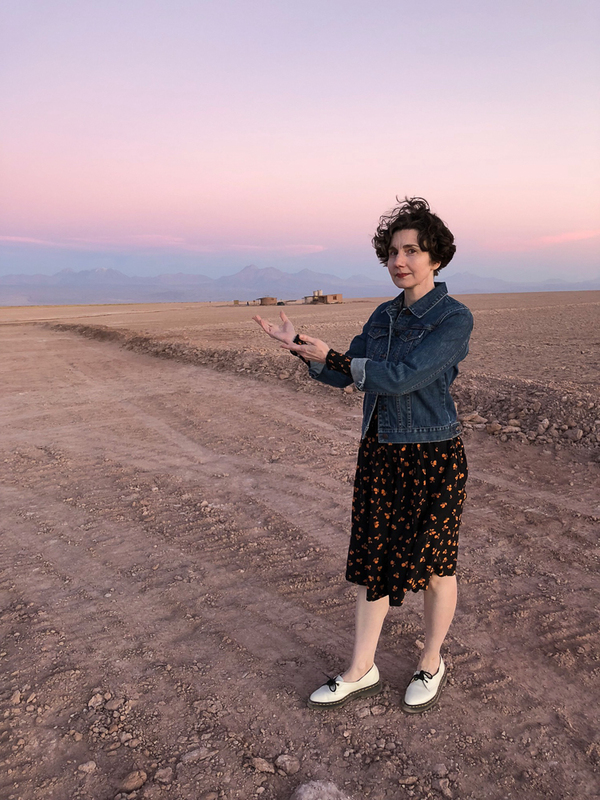 I also love knowing about the Atacama desert being closest to Mars conditions…. 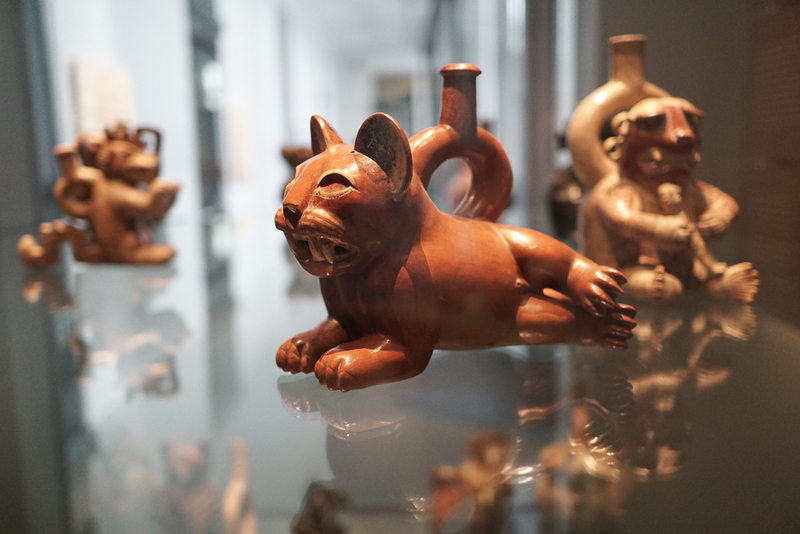 Many of my favourite objects in museums are animal figures – the best ones have recognisability, expressiveness and charm enough to transcend the millenia passed since they were first offered as a household utensil, funerary object, toy or whatever else they might have been originally used for. And thank you for treating us to these lovely pictures ! If it’s not too much to ask, perhaps you could post an itinerary once the trip is done ? Will do! This trip was an experiment for us — we used a travel agency to plan the itinerary, handle bookings, arrange all transport within the country and so far it’s been great. An amazing journey you are enjoying and great travelers both of you sharing the travelogue. Loving it and hope you do a book of this journey and possibly others. I can scarcely imagine this hotel in the midst of such a curious landscape. Mars seems possible there doesn’t it? Bravo! I rarely pack a dress for trip — but I’m inspired by how lovely the Directrice looks. 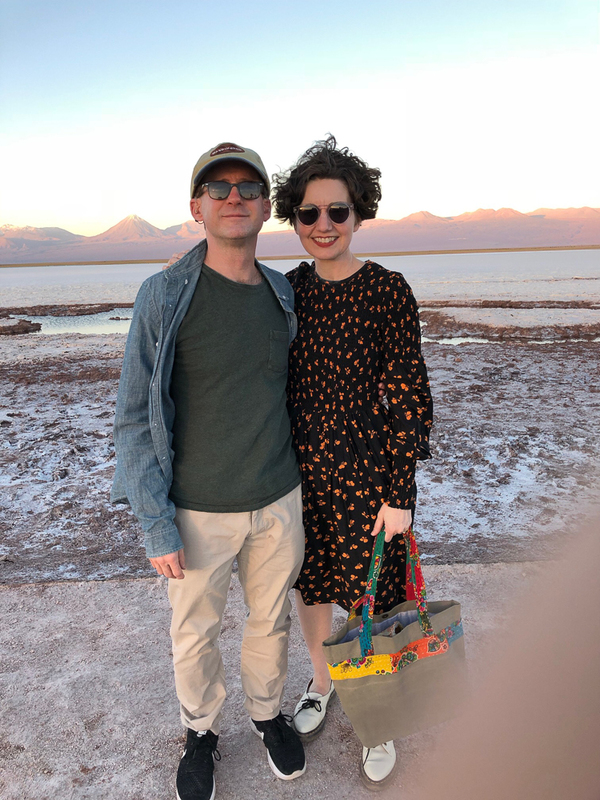 The juxtaposition of the elegant frock and salt flat background is charming. Tell us, how have you dealt with ironing and wrinkles? I think I have previously admitted to being rather lazy about ironing? So, I haven’t ironed anything. The black dress is really brilliant — the fabric has a slightly crinkly texture and thus doesn’t show wrinkles. But even the other dresses — which are poplin or broadcloth — look pretty good. I picked cotton dresses (except for the black one, which is a cotton-silk blend, predominantly cotton) so that they could be freshened-up and spot-cleaned in the sink. The true test will be seeing whether sunscreen leaves any irreversible marks. I will be a little heartbroken if it does . . .